Managing your Advocates will become easier as you start filtering them into groups. You can create groups based on customers, fans, partners, media contacts, and employees. Perhaps you want a group for Advocates who you can ask to provide references or testimonials. Maybe you want a group for Advocates who you met at a specific conference. It's really dependent on how you want to best utilize and organize your Hub. 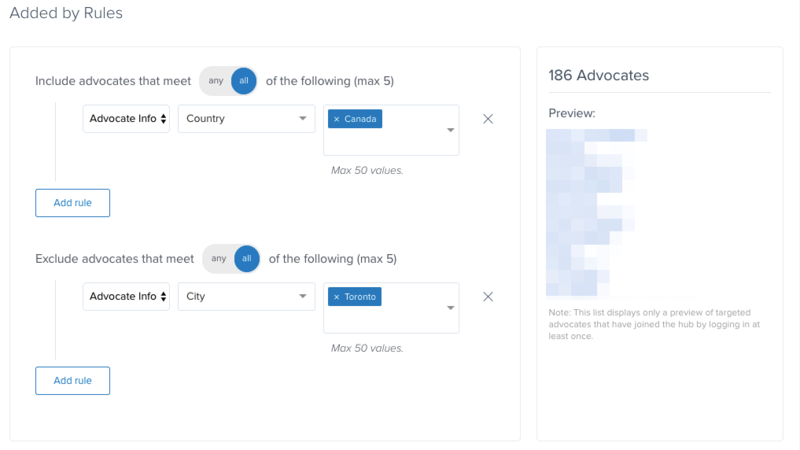 Making these groups will help you segment your advocates and your advocates will not be able to see which groups they are added to. Advocates can belong in more than one group, so your grouping can be as simple or complicated as you’d like. Later on, you'll be able to link challenges and rewards to certain groups. To create a group, click on Members from the toolbar in Admin View and select Groups from the dropdown menu. Then select Add a Group. 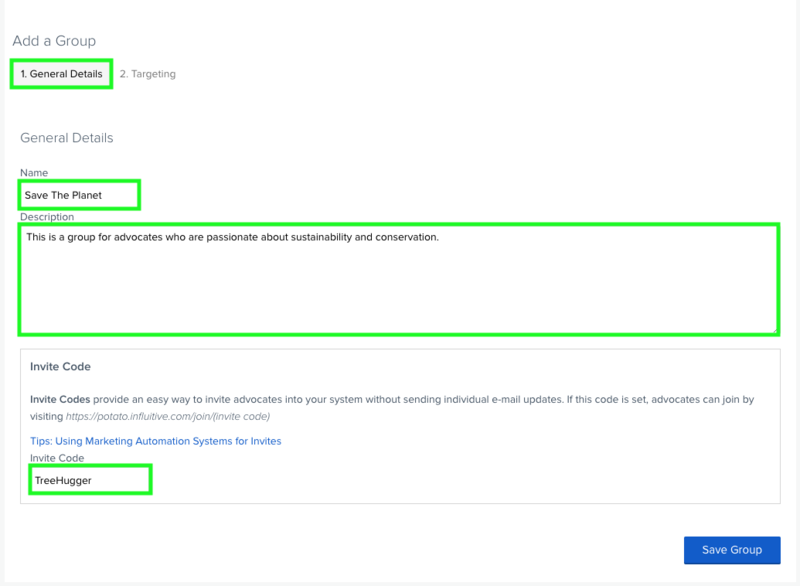 In the Groups Tab page, your AdvocateHub comes with a few preset groups, such as Starter Group, Insider Group, Employees, and other level-based groups that you can add advocates too. These groups cannot be removed. Additionally, when a Group is used in a Challenge's Targeting, you will not be able to delete the Group either. You would need to unpublished/archive the Challenge first in order to be able to remove the Group. Creating a group involves filling out a few key details. You need to name and provide a description of the group. You can also invite people to join your AdvocateHub and put them directly in this group by setting up an Invite Code. The Invite Code, much like a URL link, cannot accept any punctuations or spaces. You can replace the spaces with "-" or "_". Note: The invite Code can be any word or phrase that you think would best describe the Group. It's up to you, as the Administrator. It should be noted that the Invite Code will be public-facing, so it should be something that you would feel comfortable sharing with potential advocates.Having created an invite code, you now also have a custom URL which can be given to invitees to join your AdvocateHub through this group. You can find the Invite URL on the right side of the group page (see screenshot below). This URL can also be inserted into emails sent out via marketing automation platforms such as Marketo or Eloqua. 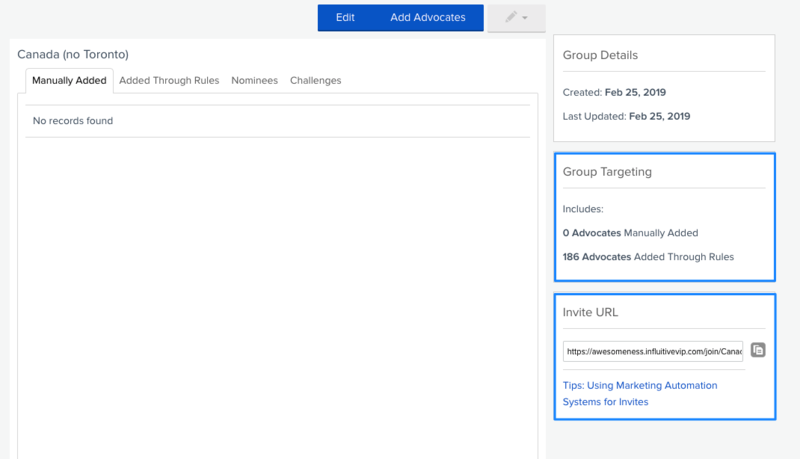 There are three ways to add advocates to Groups:Using the aforementioned Invite URLs in the previous step. 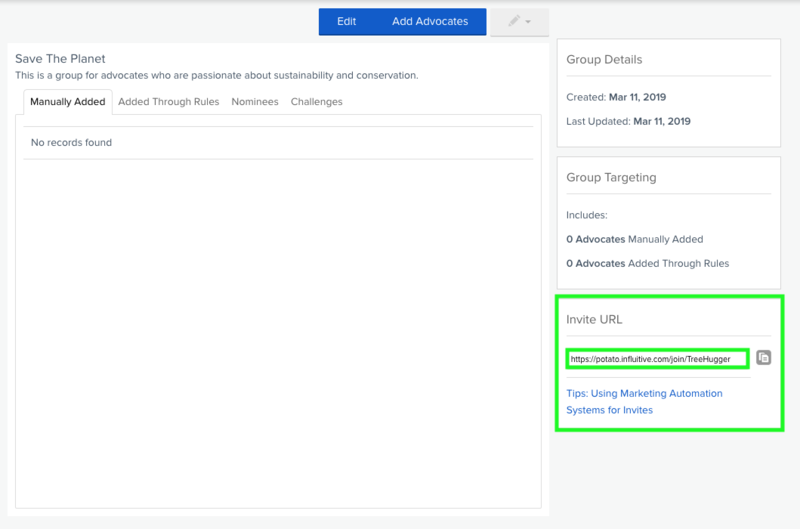 While in the Groups tab of Admin View choose the group you'd like to add advocates to and click on the Add Advocates button. Begin typing the name of an advocate and you will see a list of matching names appear. Click on the appropriate name or use your arrow keys to select and press enter. You may choose as many advocates as you wish through this method. The targeting in the Group we made here together is set to Everyone under the Include Members section. When this selection is made, everyone in your hub will be included in this group. This is useful for the cases when you want to include every joined advocate except a few people or a specific group of people. You can find out how to exclude people in the next section. If you would like advocates who match specific criteria to be added to a group, check off the second option. You will also note the option to include members who meet all or any of the conditions from the drop-down menu. Responses: Includes advocates based on their response to a question. You can choose to segment an exact response or a response which contains a certain word. 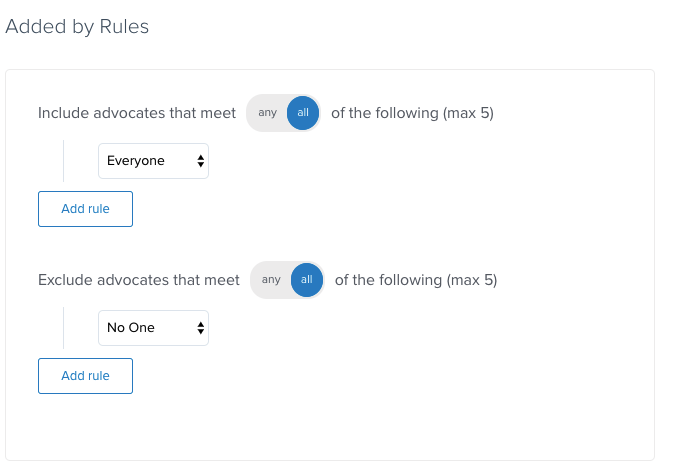 For each rule you enter, you will see the number of advocates found in your hub who match the criteria. If you would like to exclude some advocates who may be included in the rule you created above, you can do this in the Exclude Members area - Exclusion rules are set up in the same manner as inclusion criteria. In the example above, we have included Advocates in Canada. We can now exclude all Torontonians from this group. After you have finished filling out all include and exclude criteria, you will see a list of advocates who match these criteria to the right side as seen below. Note: Remember to click on Save Group to preserve all your changes! You can head over to the Advocate's full profile > Groups Tab > Click on the ' x' mark to remove the Group. The advocate is added back to the Group even after I have already removed the Group from the Advocate Profile. Why did this happen? The Group targeting will supersede this removal method so please make sure to check the Group's targeting rules so that the system will not add the advocate back into the Group again after you've removed them. 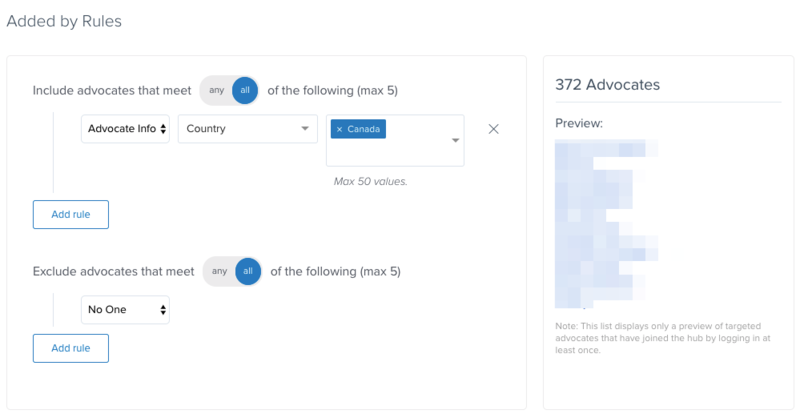 On the right side of the page, you will see the details of the group - such as when it was created, last updates, member count, and inclusion rules. If you have added an Invite Code to the group, you will see the Invite URL on the right sidebar. The Manually Added tab: Here is where you'll find the advocates you added in through their profile. The Added Through Rules tab: This is a list of all advocates who meet the targeting criteria you've set for this group. The Nominees tab: When you add a nominee, you have the option to add them to a group. If you have done so, they will appear under the nominees tab of the appropriate group(s). Once you invite that nominee into your AdvocateHub, they will appear under the Advocates list with a Not Joined flag. While they exist in the nominees list, they will appear under this tab. You can check out this article to learn more about nominating people: Nominee Management. The Challenges tab: Here you can see which challenges are targeted at this group. You can learn more about targeting challenges in this article: Challenge Targetting Overview.